Consumer trends and behaviors are changing rapidly with advances in technology.The keyword “Beauty” is one of the most searched terms on the web with almost 4 billion queries received annually according to estimation by L’Oréal. They want beauty to be closely connected with technology.That’s what is connected beauty all about. Nowadays, consumers interested in beauty care want to see how technology can provide them a better personal experience and make them feel connected. Beyond just improving your good looks, today’s apps and devices can also empower the connected consumer to self-diagnose beauty issues, and respond accordingly to imperfections. They prefer to see what a perfume smells like or may be even try on a lipstick and experience it before actually coming up with a final decision to go ahead with these beauty products.With everything available online,Consumers are now preferring to do preliminary research about their choice of beauty products in detail and then head out to offline stores to experience the product live.That’s how the mentality has been changed when it comes in the buying and decision making process. According to a research data by Adage it was found that almost 80% of women in US use their smartphone to get product details before the purchase.This means that, there can be almost 40 points of contact before a purchase is made. Coming to the global skin care market which clocked revenues worth USD 83 billion in 2013 and with a CAGR of 5 percent through 2013-2018; the market is anticipated to garner revenues worth USD 106 billion in 2018. The facial care segment dominates the market with more than 50 percent of the share. Geographic wise, Asia-Pacific accounts for nearly 45 percent of the overall revenue generated from the skin care segment. With the hair care market, millennials are now becoming more fashion conscious and are turning to hair styling and coloring products to express their individuality. According to industry experts, the global hair care market is characterized by nearly 10,000 launches per year. The European hair care market clocked revenues worth USD 18 billion in 2013; it is anticipated to generate revenues worth $24 billion in 2018. Shampoo comprises the major portion of the EU hair care market which accounts for 38 percent of hair care’s overall revenue. In India, the hair care products industry clocked revenues worth USD 2 billion in 2013. Market growth is expected to slow to a yearly rate of just over 10 percent between 2010 and 2018, with revenues anticipated to touch USD 3 billion by 2018. So what are the innovation trends which are shaping up Connected beauty ? Let’s find out! AI and chat-bots are playing a major role in Beauty and Personal care industry. AI and chat-bots are powerful technologies, that not only changes the consumer engagement but also helps in analyzing the skin types, consumers preferences etc. New research from Accenture reveals that businesses that successfully apply AI could increase profitability by an average of 38 per cent by 2035.Young laboratories are using AI to become the largest facial analytics company. 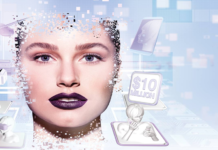 L’Oréal has embarked on the AI journey with the launch of artificial intelligence-powered Facebook Messenger bot to produce services for its beauty brands and learn more about consumers.In partnership with start-up Automat Technologies, the beauty giant has developed a series of beauty services that will soon launch in the coming months on Facebook Messenger. Their first service, soon to be launched in Canada, will be some sort of a gifting service on the FB Messenger.This service will help consumers to find the right beauty box to gift for their friends based on a series of questions that defines their friend’s beauty profile and their interests. By this L’Oréal wants to help consumers select the right brand and product mix at the right budget. The company said it hopes to launch the service in the UK early 2018.
definition of beauty (via Innovationexcellence). L’Oreal is leading the pack with digital, their recent beauty marketing efforts on Snapchat showing further evidence.In Turkey L’Oréal has launched an online magazine, Makyaj.com, attracting large numbers of young, connected consumers, with local media partnerships and beauty bloggers to boost social dialogue and exchange, whilst directing sales to major Turkish e-commerce websites. Other beauty brand who are targeting millennials through social media is Shiseido. Brands are using Social-media channels to review their products by Experts and influencers in the beauty and personal care area and are coming up with awareness based and educative/knowledge based content,in order to target larger consumers. Smartphones are being integrated widely with AR based applications to provide real-time feed to consumers regarding their skin, tan and moisture levels, show the necessary make-up needed to be done.This is built around offering consumers with more personalization and engagement at the same time provide a better experience. Recently L’Oréal presented its flagship connected beauty innovations at Viva Technology Paris show held at Porte de Versailles in Paris from 15-17th June 2017.Five of it’s Group’s brands – Lancome, Kérastase, L’Oréal Paris, La Roche-Posay and L’Oréal Professionnel – showcased how they leverage advanced digital technologies to create personalized services for consumers. Like for example,for the first time in Europe, L’Oréal presented Lancome’s Le Teint Particulier, custom made Foundation, a patented technology that precisely matched an individual’s unique skin tone to create customized foundation at point of sale(POS), offering automatic customization. 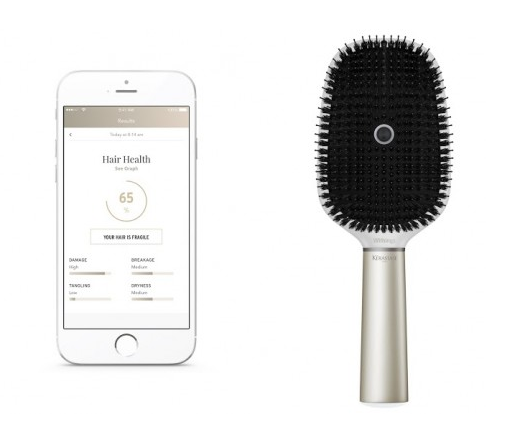 They also showcased Kérastase’s Hair Coach Powered by Withings, the world’s first smart hairbrush designed to minimize the damage of split ends and breakage associated with forceful hair brushing. It is also capable of monitoring the effects of different hair care routines and provide customized product recommendations.How does it work you ask ?Multiple sensors embedded in the brush send the data via Wi-fi or Bluetooth to a dedicated app which provides information on the quality of hair and brushing patterns, which also takes into account weather factors such as humidity, temperature, UV and wind. There are also improved sensors that will measure lifestyle habits, sleeping patterns, stress, activity, pollution and sun exposure, and combine all this data to offer customers personalized beauty advice. Connected devices have made an impeccable impact by making industry as connected beauty. Companies like Loreal, Solomomo Smart mirror, Wired Beauty, Skin wand, Uvisio, Ultra, Inc. have launched IoT based devices which helps in improved data collection and analysis and informs user about their skin texture and conditions, UV Index, moisture level in skin etc. L’Oréal is also conducting research towards connecting its wide variety of makeup products through IoT which can collect and exchange data with the help of their embedded electronics, sensors, software and network connection. IoT technology used by L’Oréal will help them track and target customers via products such as lipstick or mascara, see what their customers are buying and, in turn, let L’Oréal target consumers for future purchases. L’Oréal also discovered the new version of sun care innovation My UV Patch by La Roche-Posay, L’Oréal Group’s dermatological skincare brand, designed as a wearable,the first stretchable skin sensor designed to monitor exposure to UV radiation(sun rays) minimizing the frequency of sun burns and to select the right sun protection based on user’s skin type. It is made of five layers of complex materials complete with a high-tech sensor and photosensitive dyes. L’Oréal is also working with the University of Illinois on flexible wearable electronics, designed to collect and transmit data from the body, and has also partnered with bio-printing start-up Organovo to look at the potential of 3D-printed skin production to test products for toxicity and efficacy. 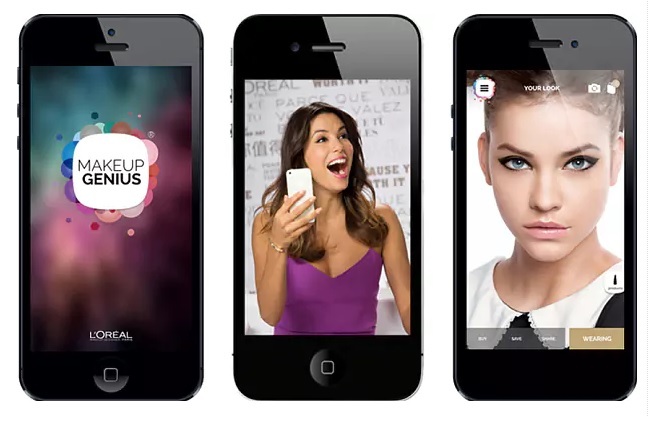 L’Oréal also launched an beefed-up version of its virtual makeup app called Makeup Genius,based on augmented reality that transforms the front-facing camera of an iPhone or iPad into a virtual mirror which allows users to try on L’Oreal Paris products – including eyeliner and lipstick – in real time. 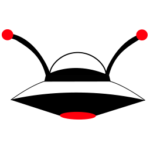 The app makes use of advanced facial mapping technology to overlay makeup onto the users face. L’Oreal worked with data scientists team from Image metrics to incorporate a facial mapping algorithm into the app.The algorithm captures 64 data points on your face, making it intuitive enough to discern between the skin of the lips, eyes and other facial contours. This means the virtual makeup moves with you as you turn your head,change your facial expression and test out new looks at various angles and lighting conditions. Makeup Genius also allows consumers to scan a L’Oréal Paris product to detect a color match, virtually try on individual products or test out looks from L’Oréal Paris expert makeup artists, and share with friends and family on social media.This app was downloaded 20 million times worldwide and +65 million online product trials.They have recently collaborated with Youcam for its Genius app. 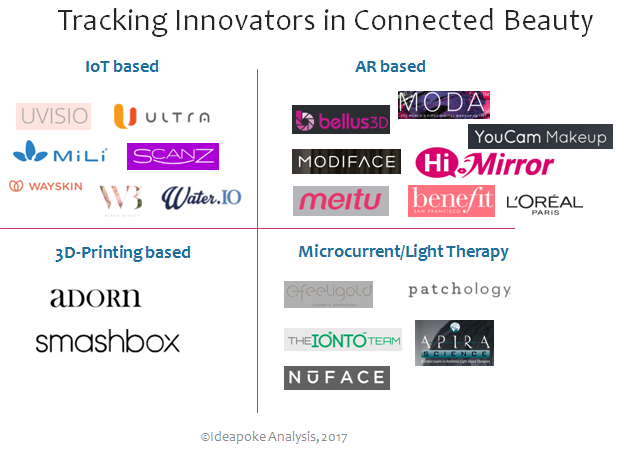 We at Ideapoke also have been tracking Innovators in the Connected Beauty space in the Beauty and Personal Care industry technology wise. This post talks about how technology is connected with beauty and how it is changing people's lives. See what are the Trends in Connected Beauty!